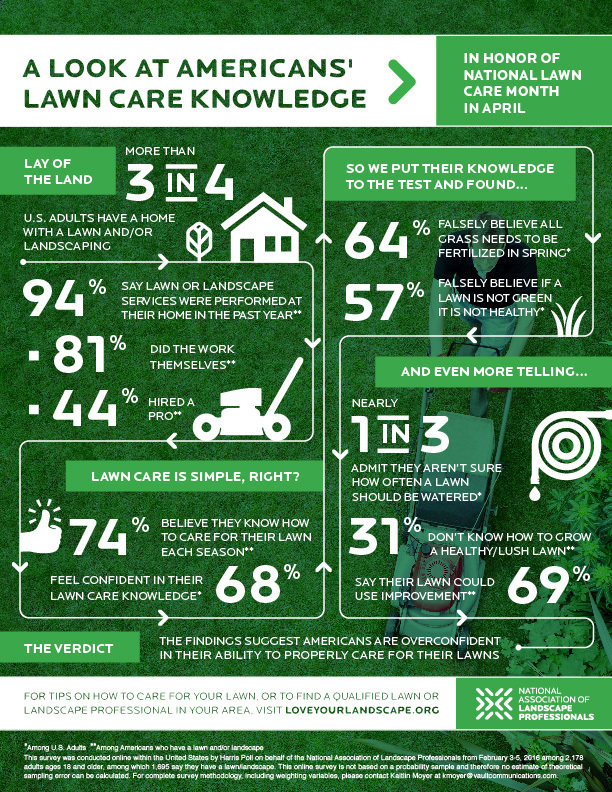 The National Association of Landscape Professionals released the results of a new consumer survey that takes the pulse of Americans’ lawn care knowledge. The results of the survey, conducted online by Harris Poll in February suggest the majority of Americans lack basic knowledge about how to properly care for and maintain their lawns. The survey, which included answers from more than 2,000 U.S. adults, confirmed that America’s affinity for lawns is still going strong. Seventy-eight percent of U.S. adults report having a home with a lawn and/or landscaping. Additionally, 94 percent of this group say lawn and landscaping services were performed at their home in the past year—with 81 percent saying they or someone else in their household performed any services themselves and 44 percent reporting they hired a professional to perform any services. Although 74 percent of Americans with a lawn/landscape say they know how to care for their lawn each season and 68 percent of Americans report feeling confident in their lawn care knowledge, the data disagrees. 31 percent of Americans who have a lawn/landscape say they don’t know how to grow a healthy/lush lawn. Even more telling, nearly seven of 10 Americans who have a lawn/landscape (69 percent) admit their lawn could use improvement, despite their reported knowledge and confidence. Water properly. Watering in the early morning is best because less water evaporates, allowing it to penetrate into the soil. Water more deeply and less frequently—one deep watering every three days is better than daily, light watering. Mow correctly. Many people mow their grass too low to the ground. By keeping the lawn at a longer, finished cut height the lawn will need less water, be more resistant to weeds and will have a deeper, greener color. Make sure your soil is healthy. Talk with your landscape or lawn care professional about testing your soil to ensure it has the correct pH balance. Aerate your grass. Aeration allows air, water and nutrients to penetrate grass roots, helping them to grow deeply and produce stronger, more vigorous lawns. Fertilize smartly. Different species of grass prefer different nutrients at different times of the year. It’s important to use the correct fertilizer and apply it at the right rate, in the right place, and at the right time. Keep in mind that a lawn doesn’t necessarily need to be green to be healthy. Under extreme heat or drought conditions, a lawn goes into a dormant state. Grass that has entered this state may be brown, but that doesn’t mean it is dead. It can stay in this dormant state for quite some time, until it receives rain or irrigation returns it to a green color. Monitor your lawn and water when necessary to keep your grass alive, but remember it’s okay to embrace a few weeks of brown grass in the summer.